Plant Developmental Biology: A warm welcome to Annemarie Krauss. A warm welcome to Annemarie Krauss. 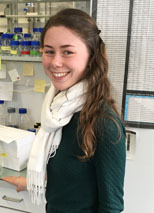 We are super-excited to have Anne joining the lab. We have known her since her undergraduate studies as she got her Masters in Biological Sciences at the TUM.